Open-Sankoré is a software designed to create and animate digital works on Linux. 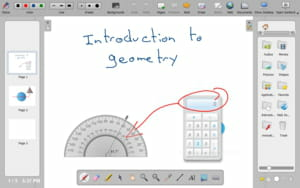 It allows you to write, draw pictures, and add annotations in real time. You can also import photos, flash animations, audio, video, and PDF files. In terms of sharing options, you can generate video podcasts or PDF files to put on the web or on a local network. Latest update on January 7, 2018 at 05:17 PM.